Come as you are and bring what you have, together we can end poverty. 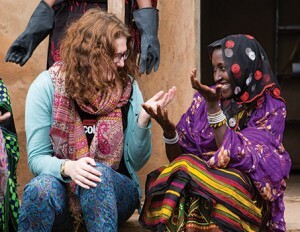 In this issue Racheal Lees from Christian Aid shares with us what The Christian Aid Collective is up to and how we can get involved. Well! For starters, we’re part of Christian Aid - an international charity who work their socks off to see an end to poverty. More than that, we are a community of passionate young people who believe that through community we can change the world. So that’s what we do! We work together creatively campaigning and giving what we have to make positive change in this world we share. How can young people change the world? Young people are passionate. We don’t need to convince you of that. They believe in a vision of a better world and that they can make it happen. Our job is to help them do that (and you too!). One way we do that is through sharing stories. When we tell or hear a story we connect with the person behind it, so you’ll find us sharing the stories of people we work with around the world to help us feel connected to each other. That way when poverty impacts anyone, anywhere, we’ll rally together to help because we know it is a threat to everyone, everywhere. One of our favourite resources is Eat Act Pray. It encourages young people to get together monthly, to share stories and create community while at the same time doing something. Whether that’s taking a campaign action or praying for an issue that we at Christian Aid work on. When Jesus sat down to eat it was always about more than just the food - something amazing always happened. People were healed, social barriers were broken down, miracles happened. We want to carry this on and have meals like Jesus did, meals that change the world! We know that young people have lots of time and not much money so we encourage them to fundraise in their churches and communities. Whether that’s a sponsored hula hoop challenge, car wash or talent show. Get in touch with us for more information. We regularly create youth resources to help young people engage with the tricky issue of poverty too. You can sign up to receive an email every couple of months to keep up to date with the latest sessions, videos or reflections. Topics include conflict, education, gender, trade, HIV/AIDS and climate change. We have lots of campaigns for young people to get involved with. We know that their voice can influence change and so know too that it is important they use it! Our current campaigning focus is climate change, as its devastating effects are already impacting the poorest in our world. We want young people to feel part of the political discussion and to use their voice. We encourage young people to lobby their MP whether that’s through writing to them or visiting them and have loads of tools to help them do it. One of our latest campaigns that would be great to engage your youth group and local church in is called The Big Switch, and you can find out more about the campaign below. We want people across the UK to switch their energy supplier from fossil fuels to one which uses renewable energy. It would be exciting if Boys’ Brigade groups got their meeting places to switch energy to renewable energy providers. Perhaps it is something you could take on as a challenge for your group?